Onyxology by AJ Mitchell, Hendersonville, Tenn.
As a diabetic, Amanda knew she needed to pay attention to her insulin levels. She takes a weekly injection, watches her diet, and has glucose tablets on hand for emergencies. Despite knowing how to regulate her levels, she had ignored the warning signs of irritability and a headache to stay on schedule. My disease pushed me to learn more. But that’s changed. 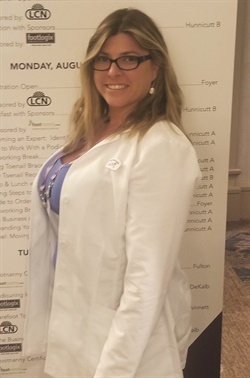 Today Amanda owns her own salon, and says what she’s learned about nail care and diabetes helps her serve her clients better. “The disease drove me to learn why we treat diabetic clients so differently,” she explains. Her drive for education led her to become a certified Advanced Nail Technician. Next is a certification as a Footcare Nail Technician, then an internship with a podiatrist on the road to becoming a Medical Nail Technician. Antonio Cremona Salon, Portola Valley, Calif.
Mary got into the nail industry in 1988. She’s worked in luxury spas and premier salons. She is certified as a CND Grand Master. Though Mary is a rock star nail tech, doing nails isn’t always easy. In 2003, when she was 47, Mary went for a mammogram and was diagnosed with breast cancer. After chemo and a double mastectomy, Mary received great news: She was in remission. Ten years later, she felt a lump under her arm. Tests confirmed it was cancer. Doctors removed additional lymph nodes, and Mary was back in remission for the next several years. 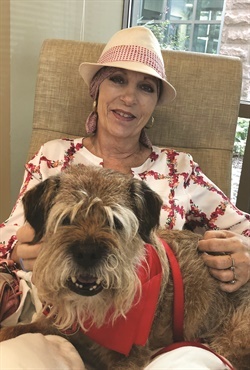 Doctors monitored Mary’s health and kept subsequent issues at bay using oral medication, but in November 2018, Mary had to begin chemo once again. Life doesn’t have to stop just because you’re sick. “I was the second nail tech in Ogden, Utah. The first one trained me,” laughs Darlene. After 38 years, she still loves the nail industry, the salon, and the clients. At the beginning of this year, Darlene started a new job at Hotlines Beauty. Within just a few months, she noticed she was more tired than usual — a lot more tired. “I would actually leave the desk and go lay down!” says Darlene. Then she noticed a lump on her neck. In April, 2018, she went to see a doctor who scheduled her for her first mammogram. She was 60 years old. “The timeline was immediate,” says Darlene. “I found a suspicious lump. They said it was benign. One week later I had my tonsils out. A week after that they tested my bone marrow. Another week later I had a port installed. A week after that I was on chemo. I had Stage III Non-Hodgkin’s Lymphoma.” Without treatment, doctors said she had about six months to live. I feel so fortunate to be where I am. I feel like I was led here. “I was mad at myself. I was mad at the cancer. I knew I had to fight,” says Darlene. Focusing on her treatment meant work couldn’t be her priority, and she wondered how her co-workers would respond. She wasn’t prepared for what happened next. 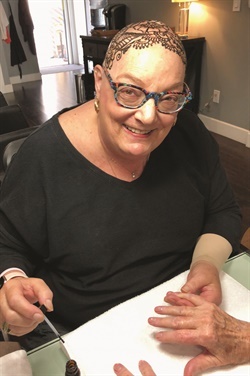 Voilà Salon and Spa, Saline, Mich.
Lori became a nail tech when she was 25, eight years after she was diagnosed with psoriatic arthritis (PsA), a condition that causes painful inflammation in the joints. Lori’s PsA also causes neck and back pain and makes it difficult for her to bend her spine. Lori’s business grew despite her condition. During her 24 years as a nail tech, she has had regular injections to reduce the swelling surrounding the joints in her fingers and hands. She’s also had surgery and fusion in her neck, along with spinal injections to “burn” the nerves that send pain signals to her brain. It doesn’t heal her condition, but it does help manage the pain. In addition to managing her salon with 11 employees, she runs a YouTube channel called “The Meticulous Manicurist,” which has over 150,000 subscribers and 180 videos, many of which have millions of views. Lori is conscientious about her self-care. Though she works over 50 hours a week, she regularly takes 15-minute breaks throughout the day to apply ice, use her foam roller, and stretch. I don’t want my disease to define me. Her chronic pain motivated her to design a creative solution for working on clients. She developed a tool that allows her to sit straighter with proper body posture. Her device prevents her from bearing the weight of a client’s hand, so it relieves stress on her wrist, neck, and shoulders.